Open Europe: Has Draghi really saved the universe? During a highly anticipated press conference, ECB head Mario Draghi - the man tasked with saving the universe after eurozone leader's consistent failures - announced today that the ECB will buy 'unlimited' government debt, albeit short-term. So the central bank that once wouldn't touch government debt with a bargepole, has now said it's willing to underwrite governments, in theory indefinitely. In fairness, we're talking short-term, sterilised bonds from countries who enter an EFSF/ESM bailout programme - so there are several catches. Still, this is a big move, which is why markets have reacted positively. • Purchases of short term debt don’t tackle the rising cost for Spain and Italy of refinancing long-term debt, and may force countries to focus more short term funding, making them more susceptible to higher borrowing costs. • Despite all the talk of conditionality, can the ECB really cut off bond purchases from a country when it is already in trouble? We doubt it, at least not without causing huge problems in the markets (which the policy is meant to avoid). • The sterilisation (removal of the money created) is almost irrelevant given the already unlimited lending provided by the ECB. • Although it claims to no longer be senior to other bondholders, would the ECB really take losses, meaning that it crosses the mark for directly financing governments, if push came to shove? • With the interbank lending market still dead and buried will a few sovereign bond purchases really restore monetary policy to ‘normality’? • These purchases tackle a symptom not a cause of the crisis, lack of competitiveness, poor growth prospects, unsustainable debt and undercapitalised banks still weigh down the struggling countries. The markets might be buoyed, but this one will drag on for much longer. 1. He has been able to push the Buba aside for the moment, but that doesnot mean Buba opposition will stop now. It is likley to go on. De factio this is not a definite decision as Draghi without full German support cannot de facto make a definite decision. 2. A bit weird was the position of the CBers of Holland and Finland mainly. They let Draghi break their block with the Buba. Likely a pretty dumb decision to let that happen. 3. Sterilised or not sterilised. Basically complete BS as like before there is the possibility to borrow more from the ECB in another way. 4. Anyway German public will see this as an EZ rescue and if for wharever reason inflation will start to rise over say 2.0% they are nearly certain to make problems. Public is not asked and it is way over their head (as it is over the politicians')and they most likley simply throw the whole thing on one pile and act accordingly. Inflation they will blame the Euro, cuts at home or zero or low growth as well. And subsequently punishment is going via the chain of command (starting with German politicians).Basically it only saves politicians agreeing. 5. Transmission mechanism is anyway very unlikely to work (a reason more why this is simply a covert gov financing operation. See btw Sober on this. 6. It doesnot seem to be working on the long term side, so you need a bail out there anyway. 7. Seniority issue not cleared. The rules can still be changed like with Greece. Imho likely the result of a lousy in house lawyer, but still has to be assured. More important if you consider short term de facto senior, the legal not seniority doesnot help much (even worse could be as short term de facto seniority means that also others benefit from it) and long term holders get hit even harder than with only the ECB. 8. Timing lousy short before Bundes Verfassungs G. Showing you donot give a .... about the law and things can be arranged outside parliamentary control will be hardly helpful. 9. Already on the reverse re short term allowed, now said because it is secundary. Just shows the stuff was badly prepared. 10. 'Unlimited' mainly towards the markets imho. Not internally. Unlimited internally will likley simply mean civil war, with Target2 going over a Tn quickly. 11. As ESM is needed and too small for an Italian bail out plus nearly impossible to increase. Somewhere they have to do another dodgy manoeuvre or simply run out of money while not even half way. On the other hand all possible ways are closed as they are stated by these players as being illegal. And law is not a political view you can change that easy. 12. Expect some mainly German court cases on this both at E-court and BVG. 13. 'Do what it takes' simply needs German money/backing to be credible. 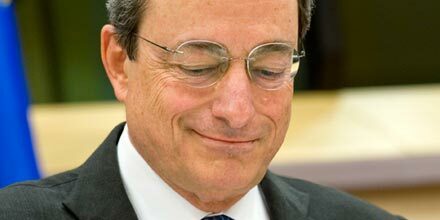 Without German backing the ECB is as credible as R. Mugabe & Cronies Printing Company. Therefor it likely will be tested and with that the relation ECB/Germany (Buba, at the moment but that can change fast). Merkel will simply drop him when political advantagous, she most likely has already made a 1/3 turn and the game has just started and the German election still has to start playing. So summarised a lot of hurdles have to be taken to make this work. Markets very positive. But like before (as a sort of standard procedure) after proper analysis will demand further assurances, but will get a lot of talk. And the whole thing will be reversed. However imho will take a bit longer this time likely more a few weeks iso 1 or 2 days like before. The reason why it will be tested is most likely the following. The ECB is not the FED, it is a paper construct of an organisation (in this respect the EZ that might fall apart). And stand alone the ECB is nearly nothing 60 Bn capital and reserves for a BS over 50 times that size and 3/4 thereof in pure undiluted garbage to toxic waste. The ECB is mainly the German backing. So to make the ECB as credible as the FED that backing needs to be 100% assured. And it simply isnot. And even cannot, as the voters over the cause of this rescue can pull country-plugs out if they want to (and so can the German CC BVG). When prices (what you pay) are considerably higher than the value (what it is worth)you simply get many sellers and very few buyers. Meaning here that with always doubt that the ECB can keep its word. As a holder of say a Spanish bond it is simply a wise decision to sell as long as the ECB gives that opportunity. So most likely we will see a substantial supply and very few other buyers so the ECB must step in to keep interest rates down. And it will be tested. The FED doesnot have that problem. And you need the complete unconditional support of the EZ-countries with money to get into a similar position. And the ECB doesnot have that and the ECB will not get that. He has given the can a big kick. Will it be 3 years along the road? I doubt it. The Germans surely will not settle for paying the dole money and the pensions for the continent and incontinent.